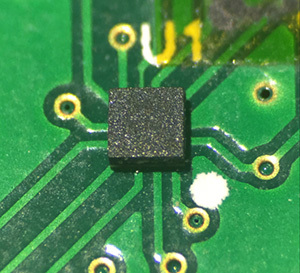 A three-axis magnetometer combines a sensitive tunnel magnetoresistive (TMR) element developed by TDK and an advanced electronic compass ASIC designed by AKM in a small package, measuring just 1.6 x 1.6 x 0.6mm. It is claimed to have the industry’s lowest RMS noise of just 40 nT-rms and a low current consumption of only 40-micro A at an output data rate of 100Hz. The high sensitivity of 10nT/LSB allows the magnetic sensor to detect minute changes in magnetic fields very precisely, enabling the detection of both position and orientation with the help of the earth’s magnetic field or a magnetic field generator. These characteristics make the TMR magnetometer suitable for compact electronic devices such as smartphones, tablets, game console controllers and wearable devices, as well as other applications that demand high position and orientation precision such as virtual, augmented or mixed reality (VR, AR, and MR) or indoor navigation. The three-axis magnetic sensor is also suitable for integration into IoT devices. Asahi Kasei Microdevices is a Japan-based company which provides customers with sensing devices based on compound semiconductor technology and IC products featuring analogue/digital mixed-signal technology. TDK is a leading electronics company based in Tokyo, Japan. It was established in 1935 to commercialise ferrite, a key material in electronic and magnetic products. TDK’s portfolio includes passive components, such as ceramic, aluminum electrolytic and film capacitors, ferrites and inductors, high-frequency products, and piezo and protection components, as well as sensors and sensor systems and power supplies. These products are marketed under the product brands TDK, EPCOS, InvenSense, Micronas, Tronics and TDK-Lambda. TDK’s main product groups include magnetic application products, energy devices, and flash memory application devices. TDK focuses on demanding markets in the areas of information and communication technology and automotive, industrial and consumer electronics. The company has a network of design and manufacturing locations and sales offices in Asia, Europe, and in North and South America. In fiscal 2017, TDK posted total sales of USD 10.5 billion and employed about 100,000 people worldwide.